Summer is here and that means it is time to get out on the water. We hope that you and your family have a great time. 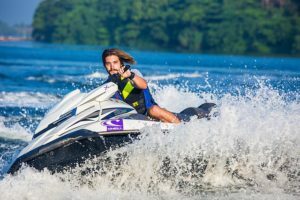 But remember, your watercraft needs to be insured, and we can provide a full range of watercraft insurance products for you. Your boat will need insurance for watercraft liability, damage to the hull, and personal property. Follow all safety rules. According to the U.S. Coast Guard, 75% of reported water fatalities in 2014 happened on boats where the driver had not received boating safety training. Be aware of weather conditions. Never allow passengers to ride on gunwales, seatbacks, or outside of protective railings, including the front of a pontoon boat. A sudden turn, stop, or start could cause a fall overboard. Follow speed laws around houseboats and docks. Know your boat's capacity and how to properly load it. An overloaded or improperly loaded boat can cause safety problems. Have a working marine radio on board at all times and know how to use it. Ventilate after fueling. Open the hatches, run the blower, and check for fuel fumes before starting the engine. Infants and young children are at a higher risk for hypothermia, so if you are taking a baby on a boat, just take a few extra precautions to keep your baby warm.